Somebody asked me today if they could have some of my prints and I don’t have any which got me to look up printers again and this time I did find some that would do good quality prints for a reasonable price and for very small print runs, i.e. one. I haven’t ordered any yet but it has made me think that I really should get off my bum in between knitting and clearing up toddler poo and do something with Martell Designs (which has been pretty much dormant since birth apart from rabbit’s friends and relations buying stuff to be encouraging) so I am going to properly investigate some different printers, maybe do some more card designs (or redo some of the ceramic stuff onto paper to generate some new card designs without actually having to have a new idea) and I thought I would see if I could work out how a blog works. I have also been wondering for a little while whether I could design any knitting rather than just knit other people’s ideas so I am planning to have a go at that some time this year (either before or after I finish the three jumpers that are either in progress or have been promised to people nearly a year ago and are now in a queue of jumpers) if I manage to design anything sensible then I will probably put it on Ravelry and maybe on here too (if you haven’t seen Ravelry then go and look at it, it has all the knitting). I’m going to try to update the Martell Designs website which is really dull and whilst putting off doing that (I really hate HTML and I don’t even understand PHP) I won’t be able to justify doing any knitting (except maybe the three jumpers that need finishing) so I thought I would start off by doing some posts about stuff that we made last year because it did seem to be a pretty good year for making things and I thought maybe someone might find it interesting (my mother, at least, will read it to be polite although she probably has seen most of it before). It goes against the grain to even think about starting a blog because I’m a fairly private kind of person so it will probably mostly end up being about knitting and making stuff but I thought I would give it a try anyway and see how it goes. Hmm, I’ve said it now, I’ll have to get on and do it, won’t I? The other thing is, I have called it Martell Designs at the moment because once I remember how the menu bar on my website works, I’m going to put a link on there but really that is an incredibly dull name for a blog and I mostly just make things other people have designed anyway so I would like a better name. Silly is good. Any ideas? 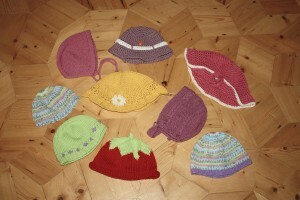 This entry was posted in Knitting, Prints and tagged In the beginning, Overuse of brackets, Plans. Bookmark the permalink. Thanks for reading it, it’s not been there very long to be fair! “Silly is Good” is a great name for a blog. Ah, didn’t spot that one in there!